AP ECET Application Form 2019 Link Available here. Aspirants who want to apply for Andhra Pradesh ECET 2019 can obtain the application process in the below sections. Candidates can also attain the APECET Online Applications 2019 along with the process. Applicants must submit the AP ECET 2019 Application Form on or before the last date, i.e., 27th March. The Online Applications for the AP ECET 2019 are available from 18th Feb on the official website that is sche.ap.gov.in/ecet Refer below sections to know detailed AP ECET 2019 Apply Online Procedure. 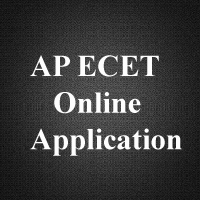 AP ECET Online Application 2019 has been Released. Candidates can Submit the AP ECET Application Form from 18th Feb to 27th March 2019. Get Direct Link for Andhra Pradesh ECET 2019 Apply Online. 1.4 How to Apply For AP ECET 2019? 1.6.1 Check AP ECET Exam Important Dates. Starting Date for Submission of Online Application 18th February 2019. 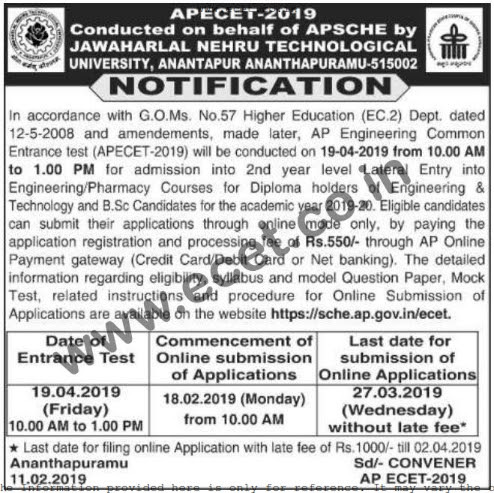 Closing date of AP ECET 2019 Online Application form without late fee 27th March 2019. AP ECET Apply Online Last Date (with late fee Rs.1000/-) 2nd April 2019. Category 2 corrections Date 3rd to 6th April 2019. Apply Online for AP ECET 2019. Here are the detail steps of filling the AP ECET Application Form 2019. The Engineering Common Entrance Test, Andhra Pradesh is conducted by Jawaharlal Nehru Technological University, Anantapur on behalf of Andhra Pradesh State Council of Higher Education. To apply online for the AP ECET exam login to the official site. The link to the official site for applying ECET is given below. This AP ECET is for Diploma Holders and B.Sc. (Mathematics) Degree Holders for lateral admission in B.E and B.Tech courses. Most of the candidates are waiting for the AP ECET 2019 Notification. For those students, JNTUA on behalf of APSCHE has released the AP Engineering Common Entrance Test Date for the year 2019. So the candidates who are eagerly waiting for the APECET 2019 exam can check the details of APECET Online Application in the following sections of this page. Here we have provided the complete details of AP ECET 2019 Online Application. So go through the following sections of the page. JNTUA, i.e., Jawaharlal Nehru Technological Universities, Anathpaur conducts AP ECET. Engineering Common Entrance Test is conducted on behalf of APSCHE. The submission of online applications for ECET Andhra Pradesh started on 18th February 2019. Check AP ECET Eligibility criteria and other conditions to apply for this exam. Applicants can apply online through the official website for the AP ECET 2019 Exam details. Students have to register for attending the exam. Through this AP ECET exam, students can seek admission to lateral admission for second-year regular B.Engg and B.Tech courses in various colleges, institutions or universities. Name of University JNTU, Ananthapuram. How to Apply For AP ECET 2019? Candidates who are going to apply for the AP ECET Exam 2019 can check the application process here. It is better to refer the AP ECET Online Application Process to avoid mistakes while filling the application. Every candidate who wants to apply for the AP Engineering Common Entrance Test 2019 should have to pay the AP ECET Application Fee. The ECET Fee may change every year or it may depend on the category also. AP EAMCET 2019 Application Fee: Rs. 550/-. Initially, you should log on to the Official Website sche.ap.gov.in/ecet. Read the Instructions carefully. Follow the Step by step process given below. After reading Instructions, Click on “Step 1 Fee Payment” on the Home Page. There, you will find following window. Enter your particulars carefully (As per SSC). To apply for Andhra Pradesh Engineering Common Entrance Test 2019, everyone should pay the Application Fee. The AP ECET Application Fee of Rs.609.00/-. Once verify the details you filled and click on “Initiate Payment”. Pay your Application fee either through AP Online or with your Credit/ Debit Cards/ Internet Banking options. Sometimes, the amount may be debited and you may not get the Receipt. This will happen because of Server Issues. In these situations, you can have an option called “Know your Payment Status“. In this step, you will get your AP ECET Application fee payment Status. Check / Know your Andhra Pradesh ECET Application Fee Payment Status. After successful payment of Application Fee, you can fill your AP ECET Application Form which is Step 3. 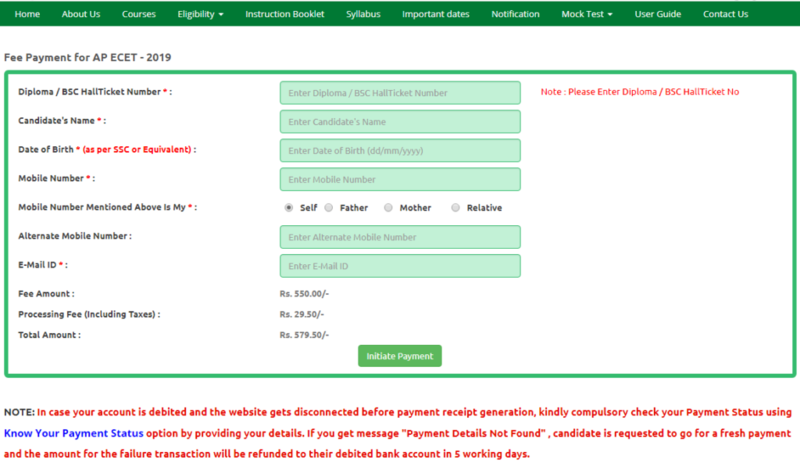 Fill the Payment Reference ID, Hall Ticket Number, Mobile Number and DOB and click on Proceed to Fill Application. Enter complete and accurate details and submit the application form. Finally, Download the AP ECET 2019 Application form by entering particulars. Print the APECET Online Application for future reference. If you have submitted any wrong details or chosen any incorrect option while filling the AP ECET Online Application Form. Don’t worry!!! you have the choice to make corrections in the AP ECET Application Form 2019. For any queries regarding Andhra Pradesh ECET Application form, you send an email to the given address. The corrections come under Two Categories: Category 1 & 2. You can’t change the Category 1 type of mistakes, but you can request the APSCHE via email. Items that can be changed by the Candidates during the permitted period. Qualifying Hall Ticket Number (Diploma/Degree). Scanned Copy of Qualifying Examination Hall Ticket (Diploma/Degree). Check AP ECET Exam Important Dates. Start Exam Preparation: Check Andhra Pradesh ECET Exam Syllabus and also the exam pattern. Click and download the AP ECET Exam Last 5 years Question Papers PDF for free. Candidates can click on the below link to reach the direct homepage where you can able to start your APECET Online Registration, Fee Payment and Online Application fillup. Start your preparation immediately after submission of Andhra Pradesh ECET Online Application. HAI GUYS ,ANY PROBLEM RELATED TO APECET APPLICATION FORM CORRECTION ISSUE PLS MAIL TO [email protected]. because i soived my problem in mail only. Sir, I am unable to open the link which directs to fill the online application form. Please suggest me how to submit the application? Not open the website application starting date :: Feb 3rd week but not open the website & not taken to application please the problem early as possible. Please intimate the application starting date for AP SCHE website. is any problems with this? ?